You don’t need to know much about eSports to know that it’s the MOBA genre – or Multiplayer Online Battle Arena – that rules the roost and, among them, the likes of Dota 2. As a type of game it brings in the most viewers, offers the biggest prize pools and has the most teams competing to be declared the best. Of course this is spread across a number of different games, from the hugely popular League Of Legends, the third-person MOBA Smite or the sequel to the game that started it all – Valve’s Dota 2. 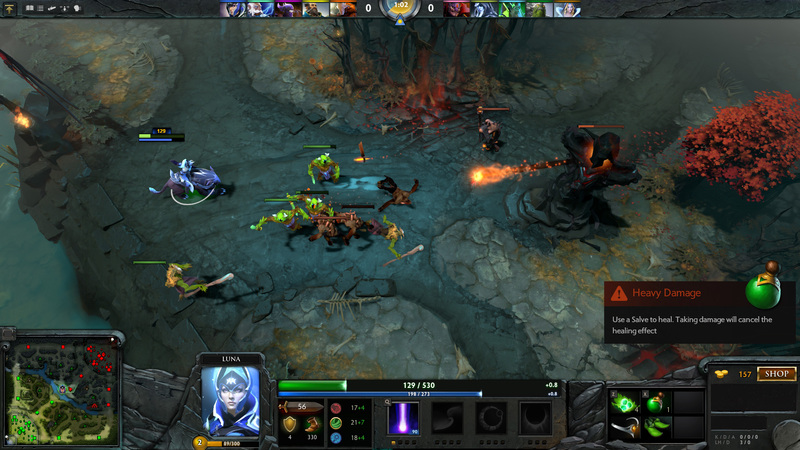 As far as Dota 2 goes, however, it’s not exactly the easiest eSport to get into. Even an entry level understanding of the game requires an understanding of the core mechanics, the rules and even the different gameplay strategies – and that’s before you begin to figure out the teams and the tournaments. Long before MOBA was known as MOBA there was Defense Of The Ancients. This humble mod released in 2003 and created for Blizzard’s incredibly popular strategy game WarCraft III twisted the core mechanics of the strategy game into something completely new. Rather than building bases and gathering resources – as is typical in the RTS genre – Defense Of The Ancients (or DOTA, as it obviously became known) utilised WarCraft III’s unique hero system to instead pit two teams of five against each other. The idea was a simple one: defeat enemy minions, expunge opposing players and chip away at base defenses until you destroy the base (or the eponymous ‘ancient’). That’s the core MOBA gameplay at its base, even to this day, but it was DOTA that started it all. The huge success of WarCraft III meant that there were plenty of players with access to the base game, meaning that when this free mod came around it quickly took off. The originality of the gameplay gave something completely new for players, and it continued to rise in popularity. Gameplay tweaks were made, new features added but – most important than anything else – additional playable characters were added until there were over 110 playable characters to choose from, each with different stats, gameplay styles and abilities. It took many years before the effect that DOTA had on the games industry would be truly realised. An eSports scene would begin to grow out of the initial years of the mod, with a tournament even being played competitively at Blizzard’s own BlizzCon event in 2005. It wasn’t until 2009 that the mod’s influence came to fruition. In that year Riot Games’ first and only game – League Of Legends – was launched, while Demigod utilised many of the same gameplay elements. Valve even announced a sequel to the game in 2009, though the game would not be officially released until 2013. Dota 2 – which is its official name and not an acronym for Defense Of The Ancients – would initially launch in beta in 2011, with more and more invites being sent out to Steam players for testing until the gameplay was refined to a point that Valve was happy with it, officially launching the free-to-play title in July 2013. From then on Valve has focused heavily on the game’s eSports popularity, drawing in hundreds of thousands of players a month and millions of viewers for its tournaments each year. And it’s just beginning, too; the game continues to grow in popularity, and Valve will be adding to it for years to come yet. Before we get onto the eSports side of things we should probably cover the game itself. See, unlike shooters and fighting games, MOBAs aren’t the simplest of concepts to follow. The core idea is pretty simple – just get into the enemy base and destroy it – but there are so many underlying mechanics and gameplay elements that it’s really not that easy to jump in without some explanation. The map itself is quite specific, and a core element of most MOBA games. It is divided into three ‘lanes’, with the two outer lanes following the edge of the map itself. AI-controlled minions will spawn at both bases simultaneously, following each of these lanes until they meet and start fighting each other. The idea is to earn gold by killing minions, other players and destroying structures. This gold is then spent on items and upgrades, improving the stats that affect how much damage, defence or speed the player is capable of. In addition to this, there is the jungle. Both sides of the map feature a jungle, the forested area that separates the three lanes. This is home to neutral monsters, which can be slain for larger sums of gold and experience than your typical minion. They take a little while to respawn, too, adding to the important strategic layer of anyone wanting to use the jungle ‘creeps’ to their advantage. 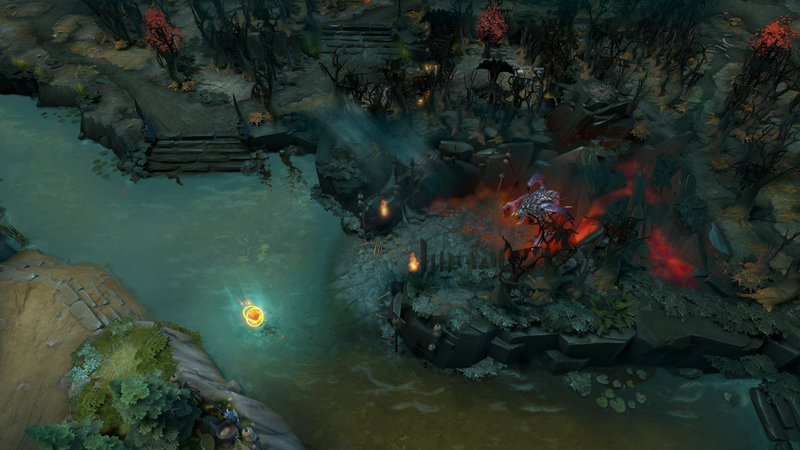 Further still is Roshan – officially Roshan the Immortal – a larger, more powerful enemy that inhabits the river running straight through the centre of the map. This monster is unique since it is the toughest neutral monster, and gets stronger as the game rolls on. Few heroes can take this beast on solo, even later into the game, making Roshan an important team objective to aim for as soon as they can since slaying it will reward each team member in the party with gold as well as dropping an item that can give the holder a second life – an important boon in any team fight. 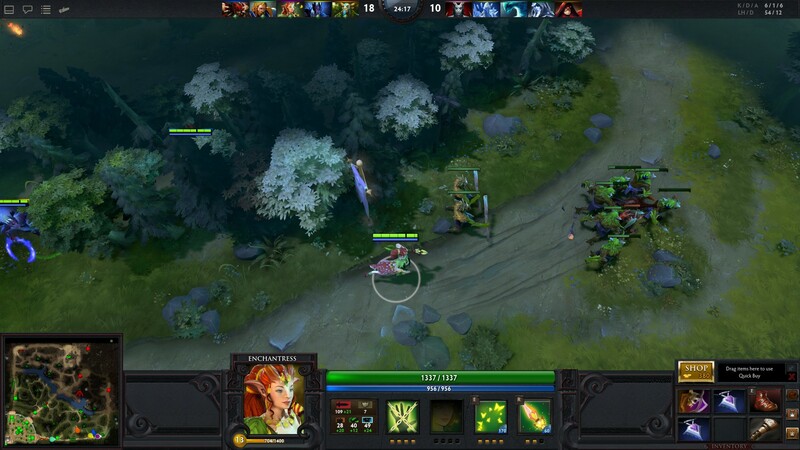 But this is all rather typical of a MOBA, what is it that makes Dota 2 so different? Perhaps the most unique element of Dota 2 is its potential strategic variety. Where many MOBAs have a fairly strict metagame – the best possible strategy for playing on the current patch for the game – Dota 2’s eclectic mix of heroes and the way they play and interact with the game means many more options are available. In most games you may see a typical 2-1-2 setup, meaning two players are in the top lane, one in the middle lane and two in the bottom lane. This is the most common you might see if you’re just playing Dota 2 online. However better players and teams can handle different options. Maybe you’ll have an offlaner, a player with a hero who has the right mix of abilities and attributes that enables them to successfully defend a lane against two players at once, escape from assaults from roaming enemy team-mates or safely kill minions for gold even while being harassed. The benefits are numerous, too. For one thing, the experience points aren’t shared, meaning the offlaner will be able to level up quicker than a dual-lane since they will both share the experience earned. In doing so it frees up a position, and this is where the variety of strategy comes in. For example, perhaps a team will opt for a jungle, a player who will battle neutral creatures in the jungle for their gold and experience points while jumping into each of the three lanes to help out against assailing enemies. Or there could be a tri-lane, where two support-like heroes will assist the gold-craving damage-dealing Carry role, helping them to safely farm their minions for gold while harassing the opposition to restrict the enemy’s gold earning. Alternatively another offlaner with good utilities and crowd control could roam, placing wards to track enemy movement and help out with nearby fights when possible. The options are pretty robust, and a good example of what makes the strategy of Dota 2 so interesting. Different teams have different playstyles, and both sides will need to adapt to their opponent’s preference while incorporating their own ideal way of playing. Most MOBAs feature a number of items and upgrades you can purchase for your hero, and in that sense Dota 2 is no different. What does differ is the way these items are bought. While it is possible to buy these items from the base store – as with most MOBAs – but Dota 2 has further options. The two Secret Shops located within the forestry of the map have unique items that can only be bought from these locations. Other items require components from the Secret Store, which can make getting to one quite an important strategic element. 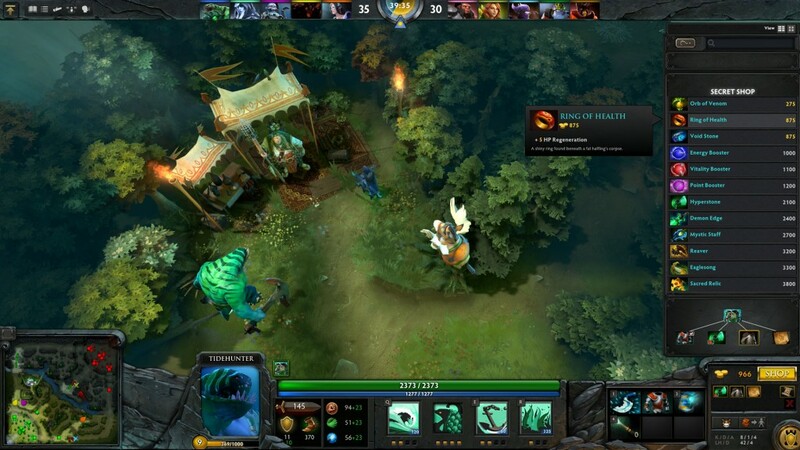 Thankfully there is another method of accessing the stores in Dota 2, the courier – a special, player-controlled unit that can be used to purchase items for you (from any store) and deliver it right back to you. Dota 2 is a game that relies heavily on trying to stay out on the battlefield for as long as possible since players need to try and maximise their experience points and gold gains as much as possible. This makes couriers integral to a match. They can purchase upgrades and even health recovery items, from potions to tangoes – which allows the player to eat trees. Why would they do that? Well, using a tango charge recovers health over a slower period of time than the typical healing salve – but its cost makes it far more value friendly. This is something that Dota 2 players really need to consider since, more than in any other MOBA, a good player is efficient with their money with smart purchases and resells. Stocking up on healing salves instead of a mix with tangoes is not a smart strategy. Sure, the healing effect is stronger and heals quicker, but early game it’s better to be cost effective and get those early weapons and armour rather than wasting the excess cost on unnecessary expenses. As a result, recalling back to base is very much a last resort option. Though there are other ways to teleport around the map, the most common is to purchase a town portal scroll to return back to base. By being out of lane, however, the opposition can earn much greater experience and gold and perhaps even deal some damage to your towers. It’s incredibly important to stay in lane, which makes the early harassment game a central strategy in Dota 2 since it can provide a player with an advantage if they’re able to force their enemy to return to base. 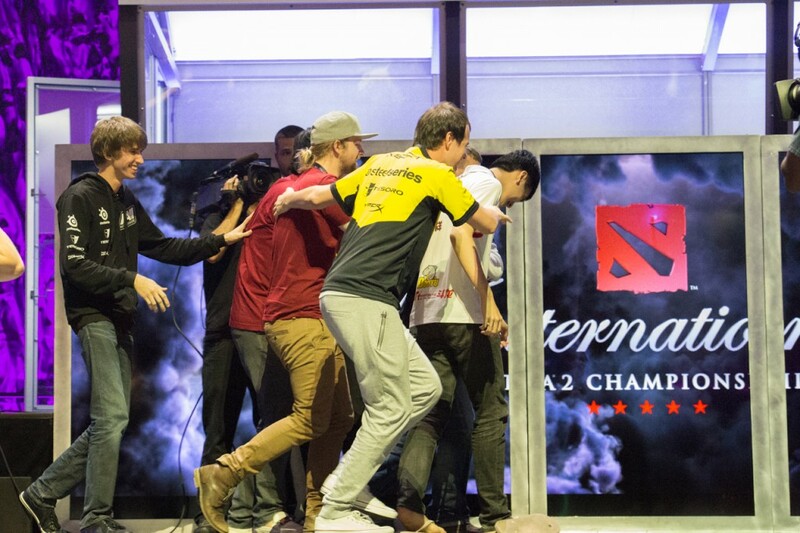 Unlike many eSports, Dota 2’s competitive scene isn’t quite as strict and defined. Where games like League Of Legends and Smite have pre-defined seasons where teams will compete regularly in a bid to play at the finals, Dota 2 only really has different tournaments. Many of these include qualifying rounds and teams are often invited to compete, but in many cases the tournament is over within a week. In terms of official tournaments Valve was initially only running The International, its annual tournament that with a prize pool funded by the players of the game. By purchasing certain in-game items, Dota 2 players add to the total available prize funds – with last year reaching a massive $18 million in prizes being handed out to competitors. However, Valve is now looking to improve team engagement with fans by increasing its official tournaments, and has added three Majors to the season lineup. One each in autumn, winter and spring, these tournaments take place in the three different locations around the world, culminating in the already popular International. Outside of these official tournaments, there are still plenty of opportunities for teams to take part in competitions throughout the world. While none of these compete with Valve’s own monetary backing, they still provide a great deal of the highest-tier competition. And then there are smaller, more minor events with only smaller prize pools available, some even taking place weekly for roughly $1,000 in prizes. You likely won’t find the biggest teams playing at these events, but they can be a great way to introduce yourself into the Dota 2 eSports. As the final remaining Major this year – having followed Frankfurt and Shanghai already – this is the final stop for teams to prove their value and become deemed worthy for The International. This tournament, like the rest of Valve’s Majors, offers $3 million in prizes, with the winning team receiving over a third of that. Dota 2’s biggest event is now in its sixth year, and will have the very best teams compete for the ultimate prestige and (in all likelihood) a huge sum of cash. The prize pool is not yet defined since, around the time of the tournament, it will be possible to buy a Compendium from the in-game store. In doing so the prize pool will be increased, so the more interest the tournament has the more money teams will be competing for. ESL is one of the biggest eSports companies, so its handful of tournaments each year are a fairly big deal. This will be for the Southeast Asia bracket, with the biggest teams of the region playing for $250,000. This Russian tournament is the newest on the Dota 2 eSports scene, but is currently offering the largest prize pool outside of Valve’s own official tourneys with $500,000. Eight of the world’s best teams will be competing in May, with two teams securing their place through qualifiers. Another ESL One Dota 2 competition, and another $250,000 up for grabs. Three teams are invited, while the remaining five slots are filled by qualifiers: three from Europe, one for Southeast Asia and one from China.